Before its controversial and ground-breaking publication as a book in 1822, Thomas De Quincey’s autobiographical account of opiate addiction Confessions of an English Opium Eater was first published anonymously in The London Magazine across two issues in September and October 1821. Just over 187 years later in our Dec/Jan 2009 edition, the academic and literary historian David Punter took another look at De Quincey’s opus, exploring the societal implications of addiction, the influence of Jean-Jacques Rousseau, and the notion of De Quincey as ancestor to William Burroughs. The essay is produced in full below. The main question about Thomas De Quincey’s Confessions of an English Opium Eater, first published in The London Magazine in 1821, remains today what it has always been: namely, what is it? What is this strange book – is it a fragment of an autobiography? Is it an attempt at ‘impassioned reading’, whatever that might mean? Is it part of a continuing cultural argument about the virtues and failures of addiction? Should we take it metaphysically, as an attempt to send back messages about life from a place where no communication is possible? Or should we treat it with a certain contempt, as an attempt by an addict to make his life with drugs seem more interesting than it really was? Opium, De Quincey says, brings gifts: it provides an antidote to life’s discrepancies (“rich and poor”) and also to life’s disasters (“wounds that will never heal”). It could even, De Quincey appears to suggest, have provided Macbeth with a little relief from his burden of guilt. And what if we wake up in the morning and life’s woes return? Well, what indeed? Life’s woes are there anyway; they will be made no worse through the purchase of a little time out, a little “assuaging balm” for the desperate soul. Because, of course, De Quincey was desperate – or so he claims; his early life was notoriously unstable, and as a consequence so was his relationship with London (which is a subtext that runs right through the book, exemplified particularly in the early apostrophe to Oxford Street) where he felt sometimes an outcast, an outlaw, overwhelmed. Perhaps De Quincey liked being overwhelmed; he certainly liked vastness and infinity. Addiction does this; doesn’t it? It provides an experience of being overwhelmed, of being forced to abandon all hope of making sense of things on our own; it pushes us back to our place in the world, which is a place characterised above all by dependency. We cannot be depended on; we are outside the conventional laws of morality and relationship – thus another paradox: we are linked into some universal tide, yet we are also severely, almost puritanically, on our own. We might wonder if that was something of what Hunter S Thompson felt when he put the gun to his mouth. De Quincey loved London, hated London, feared London, was addicted to London: city of dreadful night in which one comes constantly upon “such knotty problems of alleys, such enigmatic entries, and such sphinx’s riddles of streets without thoroughfares, as must, I conceive, baffle the audacity of porters, and confound the intellects of hackney-coachmen.” Yes, indeed, these intricacies, these arabesques may well “confound the intellects” of those referred to by alcoholics as “earth people”; but to the addict these mysteries are ultimately readable, even if, by the customary singular twist, what they reveal can never be brought back, can never be recounted under the conditions of ordinary (“unimpassioned”) language. The problem runs down through the history of drug use and especially its link to creativity – which can be seen at one of its high points during the moment of English romanticism within which De Quincey was writing, but which we could also trace right back to the shaman’s ingestion of semi-toxic fumes prior to his revelation of the sacred word. And there is another root: those fumes might produce revelation; but unless handled by a master – precisely the point, the authority of the shaman – they could result in death. Just so with De Quincey: there is a danger, a null point, the possibility of an ending deep within the drug experience, a dicing with death which grants an added frisson to life, which means that the risk is all-important. It is interesting to contrast, coming to the concerns of today, the reputations of the addict and the mountaineer. The addict is in search of extreme experience (or at least was, before the conditions of addiction set in); the mountaineer is in search of extreme experience. The addict can never fully recount the experience – both are usually consigned to the non-linguistic sounds of sublimity when they try to explain what has been going on. But the addict is criminalised; the mountaineer is exalted as somebody who is doing something on behalf of the whole human race, something of which we ought to be proud. And yet alcohol leads into daily dangers – for instance of delirium tremens. But no man ever heard of opium leading into delirium tremens. In the one case, there are well-ascertained and notorious dangers besetting the path; but, in the other, supposing any corresponding dangers to exist, they have yet to be discovered. It is a difficult and complex argument, and thinking about it in a contemporary context there are two flaws in it. The first is that medical opinion now suggests that alcohol does not cause delirium tremens, what causes the DTs is withdrawal from alcohol (or, indeed, from most forms of barbiturate). The second is that these dangers have now, of course, been discovered; but this again only throws us up against the question of choice. Choice to self-destruct? Choice to contaminate entire communities with supplies of substances that render the law and the ethical irrelevant – or, at least, forgotten for the duration? What the 1960s still tell us is that the question of drugs is inseparable from the question of the influence, powers and dominions slip-slide away; we cannot be recalled, we cannot be called to account. For the State, this is insupportable; where would we be with ID cards, the paraphernalia of surveillance, if from time to time we experienced difficulty in remembering (as De Quincey did) who we are and why we are here? We would be out in No-Man’s-Land, beyond borders, without passport; we would be in a world so vividly depicted by De Quincey’s great successor, William Burroughs, as a realm of paranoia, a realm where the Thought Police are constantly patrolling the boundaries, where the only escape is into an inner space where we can hallucinate their absence; at least until the night knock on the door. Is Burroughs De Quincey’s successor? Well, in one sense, obviously not: we could not say that De Quincey’s experiences brought him close to revealing the violence at the heart of all things. Neither could we say that he was a participant, however unwitting, in a call to revolution (at least in his own time, however his book, or even only its title, has been used since). And that title is fascinating; “Confessions”, of course, like Rousseau. But the term “confessions” is there supposed to refer to a certain innocence, there is not much innocence in De Quincey’s Confessions, not least because of the complications of his childhood. And “English” opium, as the story goes, would be OK if it were to remain the province of Johnny Foreigner, with his exotic degenerate ways, but it is the infiltration of such matters into the staid heart of old Britain that might be the problem. There are splendid variations on this theme in a number of Conan Doyle stories: all, of course, set in London, and particularly on that side of London which vividly expresses its heritage as a port; a port where all manner of things may arrive, may infiltrate the body social, may be incapable of expulsion, may contaminate. In China, over and above what it has in common with the rest of Southern Asia, I am terrified by the modes of life, by the manners, by the barrier of utter abhorrence placed between myself and them, by counter-sympathies deeper than I can analyse. I would sooner live with lunatics, with crocodiles or snakes. This is a rotten passage for those who would like to see De Quincey as an early free spirit, an avatar of drug liberation. But it carries also another sense, for what De Quincey says (or at least claims) is that the root of this horror is a distaste for antiquity, for all things “antediluvian”; what he fears is being dragged back. He wants to move forward, he wants to taste the fruits of western modernity: does opium help with this, do drugs move us forward, do they enable us to escape the drag of the past? There is an obvious Freudian answer to this, which is the answer also provided by the old joke about the French Foreign Legion: “I joined the Legion to forget.” “To forget what?” “I don’t know, I’ve forgotten.” Just so, drugs enable forgetting of the past, of childhood circumstances; we might say that they permit a version (or possibly a travesty) of free-floating modernity. Or, to put it another way, if the police ask us, we can justly say we have no idea where we’ve been. But now, at last, came over me, from the mere excess of bodily sufferings and mental disappointments, a frantic and rapturous re-agency. In the United States the case is well known, and many times has been described by travellers, of that furious instinct which, under a secret call for aline variations of diet, drivers all the tribes of buffaloes for thousands of miles to the common centre of the ‘Salt-licks’. Under such a compulsion does the locust, under such a compulsion does the lemming, traverse its mysterious path. They are deaf to danger. Deaf to the cry of battle, deaf to the trumpets of death. Let the sea cross their path, let armies with artillery bar the road, even these terrific powers can arrest only by destroying; and the most frightful abysses, up to the very last menace of engulfment, up to the very instant of absorption, have no power to alter or retard the line of their inexorable advance. Is this a description of the delirium of addiction? Is it a recounting of the paranoia of drugs? No. It is a description of the moment when De Quincey decides to “elope from Manchester”. London – horrifying, overwhelming London, where a man can be a man and an addict can be an addict – beckons. There can be no escape when opium beckons you home. To join the likes of T.S. 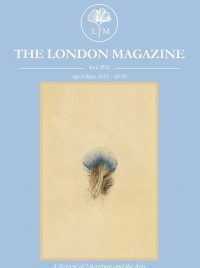 Eliot and Nadine Gordimer as essayists in The London Magazine (and to win £500), enter our essay competition here!